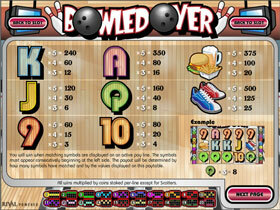 Bowled Over Slot is a Rival Gaming 20 payline, 5 reel slot with a wild symbol, scatter symbols and a bonus game feature. You can win up to 40 free games in the bonus feature. Get Bowled Over by the great wins! Bowling and Online Slots are both fun and now that they have been combined into this exciting game. There are some great features that include expanding wilds, free spins and the chance to knock down a few pins during the bonus game for some great cash rewards. 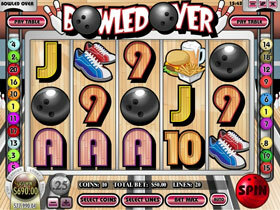 The style of the slot has been cleverly designed to look like a bowling alley and the spin button resembles a bowling ball. The reels are also filled with bowling related icons such as Bowling Balls and Pins, Red and Blue Bowling shoes, burgers and the symbols of high valued playing cards. The Ten Standing Pins icon is the Wild and substitutes all others except the Scatter and expands to fill the entire reel when a winning combination is formed. The Female Bowler icon will trigger the Free Spins when 3, 4 or 5 of them show up and will award up to 40 Free Spins with a 4x Multiplier. The Bowling Balls icon is the Bonus and will be activated when three or more show up anywhere on the reels. The player will then be in the shoes of a bowler for ten frames and the higher his score is the bigger the prize will be. Try and aim for a perfect 300 to be rewarded with the largest pay out.